Please join us for a New Perspectives tour of the 2018 Triennial: “Songs for Sabotage,” where we will examine artists’ uses of the visual language of monuments, memorials, and propaganda. Keeping in mind ongoing and recent debates about the role of public monuments and memorials—challenging the histories they celebrate, iconographies they employ, and values they serve and preserve—we will discuss installations by Daniela Ortiz, Haroon Gunn-Salie, and Claudia Martínez Garay. 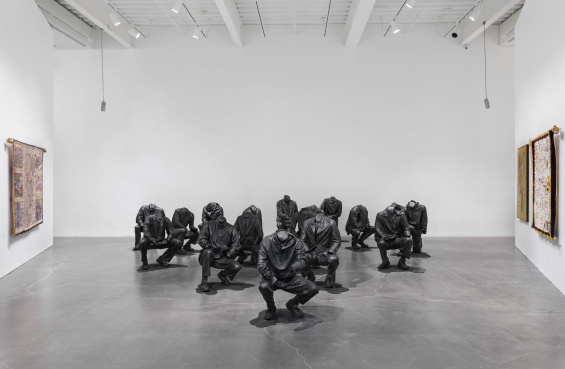 In the case of Ortiz and Gunn-Salie, we will consider how artists employ or subvert the visual language of memorials and monuments in order to bring attention to events and figures marginalized by dominant historical narratives. With Martínez Garay, we will discuss what the iconography of propaganda might share with those of monuments, and how her work Cannon Fodder / Cheering Crowds (2018) reinterprets the forms and meanings of those symbols.